The MS9710C provides excellent wavelength accuracy, waveform shape, and new features. This OSA is an improved version of the popular MS9710B and features improved wavelength accuracy, resolution bandwidth, and signal-to-noise averaging. 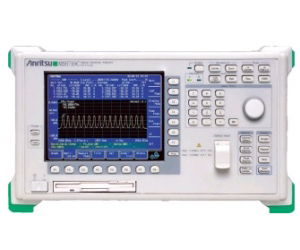 This diffraction grating spectrum analyzer covers a wide wavelength range from 600 to 1750 nm. The MS9710C features high power level accuracy, wide dynamic range, and high reception sensitivity. MS9710C has been enhanced with much better performance in the L-Band region between 1570 nm and 1620 nm. The enhancement is an option (MS9710C-15) so customers who do not require absolute accuracy for L-Band measurement need not pay for it.